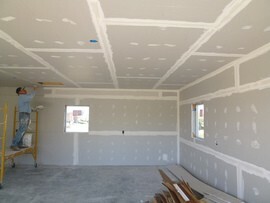 The type of drywall used often depends on the room it is to be installed in. For example, water-resistant drywall is good for bathrooms and kitchens; abuse-resistant drywall is good for playrooms; etc. The cost to install drywall in a 12'x12'​ bedroom with a ceiling height of 8' is roughly $200 (including materials and labor).